If you have a website, then you ought to know about Google Search Console. Formerly known as Google Webmaster Tools, this free software is like a dashboard of instruments that let you manage your site. Seriously, unless you prefer running your online business blindfolded, getting this set up should be any webmaster’s SEO priority. In this article, you learn step-by-step how to set up a Google Search Console account. 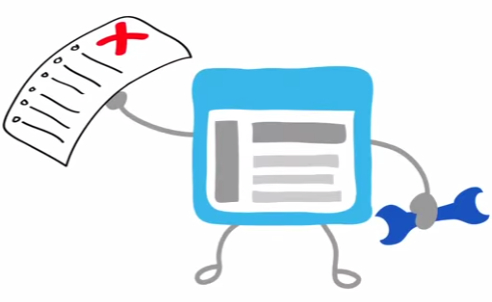 The Google Search Console mascot looks ready to help. Google Search Console is the new name for Google Webmaster Tools, a name change that makes the tools sound less technical and more inclusive. Search Console is free software provided by Google that reveals information you can’t find anywhere else about your own website. For any search engine optimization project we undertake, we make sure Google Search Console is set up. Google’s tools work for apps, as well, so app developers also benefit from the data. These webmaster tools tell you how the search engine sees your site, straight from the horse’s mouth. Here you can see site errors, check for broken pages, confirm site indexing, and more. Plus, this is where you pick up any messages sent directly from Google. Whether it’s a malware warning, a detected hack on your site, or a notice that you’ve been dealt a manual penalty — the search engine alerts you through Google Search Console. Side note: You may have set up Google Analytics for your site already. While there’s some overlap between the two products, they work best hand-in-hand to give you a more complete picture of your website traffic. For monitoring your SEO efforts and maintaining your website, set up Google Search Console as your primary tool. Google wants to connect the dots between your website (or app) and you, so first you must log in to your Google account. You can sign in through Gmail, Google+, or anywhere you have a Google account. 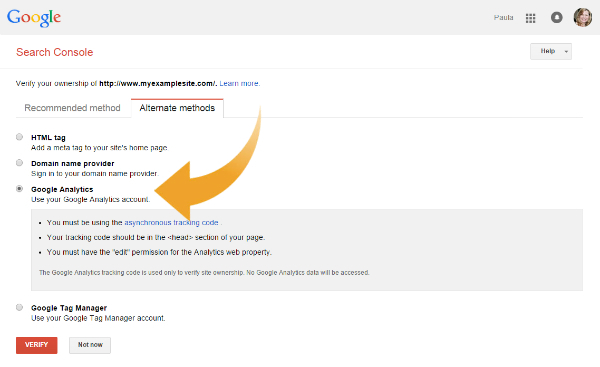 While signed in to your Google account, navigate to this page in any browser: http://www.google.com/webmasters/tools/. Type in your website (the domain URL, such as http://www.example.com/) or app (for example, android-app://com.eample/) and then click Add Property. Note: If you already have at least one property set up, you will see that display instead of the URL entry shown below. To add another website or app, just click the Add a Property button and then enter the new site’s URL. Next, Google needs to confirm that this website or app belongs to you. To verify that you are the site owner, you have several choices. Click the “Alternate Methods” tab to view them all. Choose the “Google Analytics” option. Click the Verify button. That’s the whole procedure. You’re ready to use Google Search Console! If you DO NOT have Google Analytics, there are three methods to verify your site ownership. Read on to decide which will be the easiest verification method for you. If you have access to edit your site’s HTML code, choose the “HTML tag” option. Copy the text line that Google displays in the shaded box (beginning with <meta name=). Now open your home page in your preferred website editor and paste that text into the Head section (near the top) of your home page. This creates a new meta tag. Save your changes in the editor program. Next, back in the Google Search Console setup page, click the Verify button. That’s it! If you cannot use the first two methods, try the “Domain name provider” option. From the drop-down list, choose the company where you registered your domain name. Then follow the instructions Google gives you, which vary. When you’re finished, click the Verify button. The last option for verifying your website works for people who have a Google Tag Manager account (and the “manage” permission). If that’s you, choose the fourth radio button and click the Verify button. Once Google verifies your site or app ownership, you can log in and start using your newly set up Google Search Console. Keep in mind that data takes time to collect, so it may be a few days before your new account has data worth looking at. This is an excellent time to take care of a basic but important search engine optimization task: creating a sitemap that will help Google find and index your pages faster. Refine your personal and site settings – You can customize the way you set up your Google Search Console account. For instance, if your site operates in different countries, or if you have multiple domain versions, here’s where you define your preferred settings (find out more). Set up app indexing and more – App developers can use Google Search Console to add deep linking to their apps (which allows app pages to show up in users’ mobile search results), link up their app with a website, handle any crawl errors and more (learn how). Master the Search Analytics report – Among the dozens of powerful features set up for Google Search Console, we have to highlight one. The Search Analytics report, which has replaced the old Search Queries from Google Webmaster Tools days, is a powerful tool in any comprehensive search engine optimization campaign. This is where you’ll find out which web pages rank for which search terms and much, much more. Open the tool by clicking Search Traffic > Search Analytics (for more guidance, read the help article). Great info! Thanks, this has helped me tremendously!! Thank you!!! Alena – Submitting a sitemap is a way to help the search engine find new pages or entire sites more quickly. Once Google knows where your XML sitemap is located, it will continue to process the sitemap intermittently. So whenever you add content to your site, make sure the new URLs are automatically added to the XML sitemap. A new submission of the sitemap isn’t necessary, since Google will eventually reprocess the XML sitemap and find the new links. As a best practice, keep your XML sitemap(s) updated to include all the pages you want indexed from your site. If you’re looking to have things move more quickly, you can manually fetch and render the URL in question and submit it to Google’s index using that tool. Googlebot also crawls links looking for new content, so if you have good internal navigation to new pages, they should be able to be indexed regardless. For instance, when we publish a new blog post, it’s usually indexed within minutes because Google finds it through links within our site and from readers. In contrast, we recently launched an SEO Tutorial as a new section of our site with 20 new pages. As soon as it went live, we submitted those URLs via an XML sitemap so Google would find them right away. Is it necessary to submit the sitemap again and again (after publishing new content) to the search engines for getting it indexed ? Great information! Thanks for the share Paula, webmaster’s has made it easier for everyone! Thanks for sharing this valuble information and it is very useful for me and who wants Latest Search Engine Optimization Updates and Techniques. No you don’t need to re-submit it again, as Google will re-visit it after a while to see if there are updates. You have the ability to re-submit the sitemap in the event you’ve removed some content or added new content that Google hasn’t found yet, and it’s been a while since Google re-downloaded your sitemap. Thanks Paula Allen. It works for me. Actually Yesterday I verified my website on GSC. Today I can see the crawl section in my dashboard. Can you let know “How to set manually date in G.W Crawl Error”. Actually I want last 10 day’s data together of Desktop, Smartphone, and Feature Phone. Vikas – There’s a limit in Google Search Console: You can see data for only the past 90 days. (Google Analytics shows you more, but you can’t see search queries there because it’s all “not provided.”) Many SEOs download their data monthly and set up their own Excel reports to track things long-term. As an alternative, our SEOToolSet Pro runs scheduled ranking monitors to track your site’s rankings and your competitors’ for all of your keywords. If you want more info, see https://www.bruceclay.com/seo/tools.htm. This is very useful blog but can you let me know “How to check last 1 year Top Pages and Search Query data”? Thanks Paula. Is there any way to subscribe to your articles. Pls let me know. Milan – I hear you! We get comfortable with the tools we know, but Search Queries will be going away soon. We think the Search Analytics report is even better (more data, more parameters). That’s a topic on our list! Thanks for the confirmation. 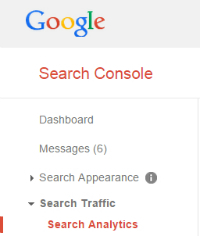 Hi Paula, Great Article on how to setup the Google search console. It would be great if you can also write few tips on how to get the best from the webmaster tools. I really prefered to the search console (GWT) tool .Its one of the best tool of google. in GWT how to check website health? Thanks Paula for the detailed explanation on Google search console. Google Webmaster was my most preferred tool to find information about my website. can you share more on Crawl section of it. Certainly Google has gifted such awesome tool for SEO people, it helps a lot to measure website behavior and check its performance whether it is facing 404 or server errors we can come to know through Google Search Console to fix them. well, from my view uploading html file is easiest way to set up webmaster . Could you please refer a guide on rich snippets please? Thanks for sharing your story and the great comments. Thanks, this clarified a lot and made my day easier. This is very helpful in a sense of actuality taking steps to fractionalize a shortcut! Also, please explain about redirecting from non www to www through Google Webmaster Tools. I implemented a 301 redirect but still its not working. Whatever a tool is named, though, the skill level of the person using it of course varies a lot. Skilled webmasters will be able to pull data more effectively from these webmaster tools than others, surely. But we know a lot of business owners and website owners who need the valuable information those tools provide, even though they aren’t skilled webmasters. Thanks for listing the “Other resources” above. That’s a useful list of other tools! This is typical of the fingerprints of inclusive imput: “Make sure your business “looks” great”? Looks? Style over substance again. “Point and click tool.” What are we now? Infants? I get the subtly. I am privy to a lot of conversions on the web. And if this is what it takes to get women included, then ladies, stay home. You work to be here. Don’t dumb everything down so you are included. Earn your stripes. Structured Data Testing Tool	Use the Structured Data Testing Tool to check that Google can correctly parse your structured data markup and display it in search results. Structured Data Markup Helper	Not sure how to start with adding structured data markup to your HTML? Try this point-and-click tool. Email Markup Tester	Validate the structured data contents of an HTML email using Email Markup Tester. Google My Business	Make sure your business looks great on Google Search, Maps and Google+ for free. Google Merchant Center	The place to upload your product data to Google and make it available to Google Product Search and other Google services. PageSpeed Insights	Use PageSpeed Insights to find out how to make your web pages fast on all devices. Custom Search	Harness the power of Google to create a customized search experience for your own website. Google Domains	Find a domain name and build a website with Google Domains. I am a Web developer/Designer. I also am female. But apparently, who knows anymore. That said, if I hear the word “inclusive” one more time, I may throw up. ;P A figure of speech, but still a point is made. This is my profession, not those who are in marketing. I am not 15 years old and no, they do not know as much about the process of web development as I a professional (and my colleagues) do. I’d like to know why so many of you seem to think you have the right to invade our profession? I agree with the commenter above, I prefer the look and feel of the classic Web Master tools. I, too, miss some of the functions that have been taken away to make this apparently accessible to the “kiddies”. Frankly, I wish you would show some respect and hire a professional instead of trying to dumb down my professional tools. Thanks for listening. i really prefered the old look and feel of the search console (called google webmaster tools). i still miss some functions in the new UI and hope the will implement them soon. im glad that at the moment the option to switch to the old UI is available.